You may remember that earlier this year Monopoly announced its plans to sacrifice one of America's beloved tokens in favor of adding some new blood. But it was ok! Because they were letting us (the internet) choose which icon of our childhood to kill and which hot young thing to replace it with. Given the options of a robot, helicopter, guitar, diamond ring, or cat, the internet chose the cat (because of course) and axed the iron. It was one hell of a trade. Like it or not, the deed has been done, the kitty cast, and as of this week, all new Monopoly boards will be coming at you new token in tow. And we're honored to be the first to introduce you to the Monopoly world's newest addition. A tiny, metallic cat painstakingly selected on your behalf by the internet to take on all of your free market, industrial needs. It looks sassy. Players of Monopoly. The internet. People who hate ironing and the subsequent success of America's dry-cleaning industry. This woman. 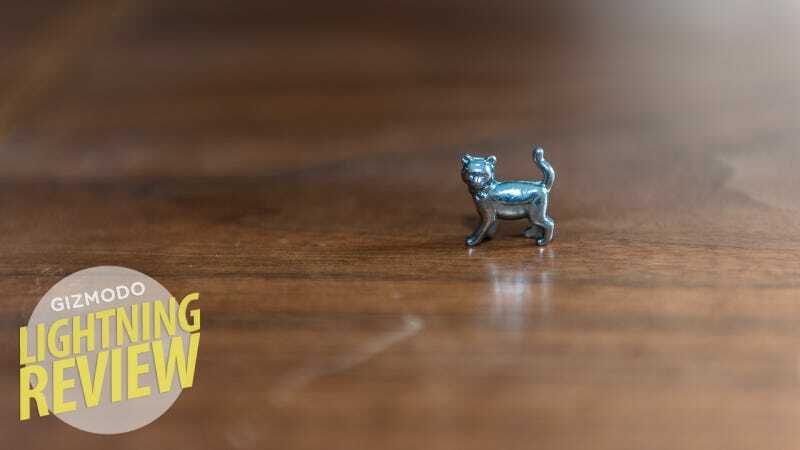 This itty bitty metallic kitty measures in at about one-half-inch wide by one-half-inch long and blends in flawlessly with its team of capitalist cohorts. It has a face, four legs, a tail—you know, cat parts. Plus, our little token feline friend is hypoallergenic, cool to the touch, and as far as we can tell, not alive. While we have yet to play an actual game with the token, we did pick it up and hold it. Several times, in fact. We found it incredibly easy to lift—perfect for children and their weak, feeble arms (conversely, also probably a choking hazard, though certainly no more so than that damnable top hat). In a game of Monopoly, the cat would act as your avatar as you negotiate the high-stakes world of Atlantic City real estate (third-highest foreclosure rate in the country!). This cat is the product of democracy in action. This cat is America. In Monopoly's excitement to appeal to the internet's most base instincts (saying yes to all cats all the time always and forever), the designers behind this industrial board game seem to have forgotten that Monopoly pieces generally tend to have something to do with, you know, industry. Additionally, there's no clear reason why the iron had to die for the cat to live. That felt needlessly cruel. The best part of the accompanying info, though, was the entire page's worth of tips for welcoming your new Monopoly friend into the fold. The presser emphasizes things like the importance of "[giving] your pets exercise, but when they're out walking, remember to take the $200 for them when they pass 'GO.' Pets should not have money" as well as keeping in mind that these are not real animals. Per the instructions, "if they start barking and meowing, seek help immediately." In other words, keep subordinates penniless to maintain power and talking to inanimate objects is bad. You're now ready to play Monopoly. We have yet to actually play a game with the cat token or use it appropriately in any way. The cat was dropped several times and may or may not have suffered internal injuries/be dead as a result. It has more pointy bits than most Monopoly pieces. Try not to put it near your eyeball. You can have ours. Viva la iron. Overall Rating: Childhood is dead.